A pack of ravenous dogs, a nightmare, a visit from a war-haunted friend: this was how film director Ari Folman’s period as an Israeli “grunt” in the 1982 invasion of Lebanon first returned to him. But when he began to search for his own memories of that war, what he found instead was a puzzling, disturbing blank. Tentatively setting off in pursuit of those missing memories, horrors buried for almost a quarter of a century, he also launched himself on a path that would lead to his award-winning, Oscar-nominated animated film, Waltz With Bashir, and an accompanying graphic memoir of the same title, developed in tandem with it. The first part of that book  of his memoir/journey  appeared at TomDispatch last week. When we left him, a former friend and fellow soldier was just describing his grim landing on a beach in Lebanon in the early days of the invasion. Now, in part 2 of Waltz with Bashir, we pick up the story soon after the seemingly blank landscape of Folman’s memory has suddenly, inexplicably, been illuminated by a  flashback? hallucination? memory?  of himself rising naked from the sea to step into a war-torn Beirut night. Part 2 of this exclusive excerpt from Waltz With Bashir takes up after Folman has managed to reconstruct his first days of the war. In the stunning, unnerving pages that follow, he begins to restore to memory his arrival in Beirut and the events that will ultimately lead him to the dark, shattering center of what he has forgotten: the horror of the massacre of Palestinians in Beirut’s Sabra and Shatila refugee camps. 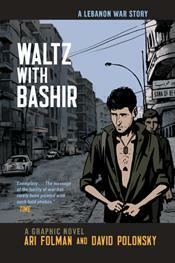 Waltz With Bashir: A Lebanon War Story by Ari Folman and David Polonsky. Copyright © 2009 by Ari Folman/Bridgit Folman Films Gang. Published by arrangement with Metropolitan Books, an Imprint of Henry Holt and Company, LLC. All rights reserved. Tom Engelhardt, who runs the Nation Institute’s TomDispatch.com, is the co-founder of the American Empire Project. His book The End of Victory Culture has recently been updated in a newly issued edition. He edited, and his work appears in, the first best of TomDispatch book, The World According to TomDispatch: America in the New Age of Empire (Verso), a collection of some of the best pieces from his site and an alternative history of the mad Bush years now ending. Too Much War, or Not Enough?